Multi-pens are always fun to use and customize, and it's interesting to see how the multi-pen version of refills compare to their single refill cousins. In the case of the EnerGel, I'm happy to report that it's a stellar multi-pen option. 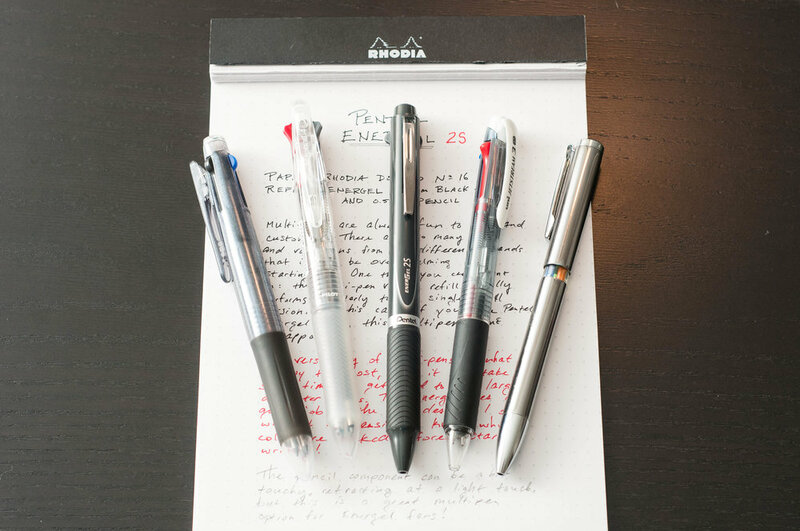 The Pentel EnerGel refill is a favorite for many people, and for good reason. The hybrid rollerball and gel ink formula lays down a dark, crisp line while also drying incredibly fast. Like most multi-pens, you can normally expect similar or identical results between the full-size and multi-pen variants. Luckily, Pentel nails it with this one as well. 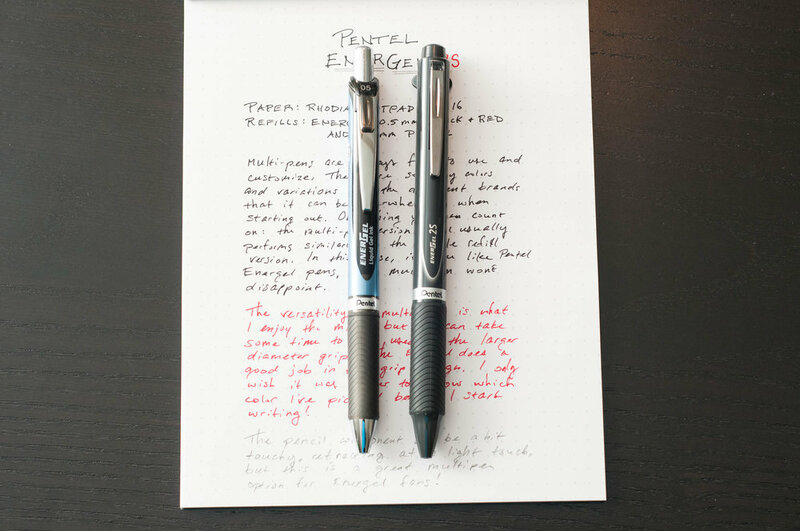 The Pentel EnerGel 2S multi-pen packs two 0.5mm ink refills (in black and red) along with a 0.5mm pencil component. There's nothing fancy as far as the mechanics go for this pen — it's standard fare for multi-pens, which is to be expected for the sub-$10 price. Press down one of the clickers to extend a refill, and press down a different clicker to release and retract the extended refill. In the case of the pencil, you can also press the top of the pen to advance the lead. Speaking of the pencil component, I've had a bit of trouble when using it. When the pencil is extended, the clicker mechanism is incredibly sensitive to touch, making it retract unexpectedly. It's been fairly common for me to accidentally retract the pencil while I re-grip the pen after depressing the pencil component for use. This can be frustrating, but it seems to work well enough as long as you don't bump the clip while using the pen. Since the clip is the pencil clicker, you can see how this might be problematic. There's no eraser on this pen to accompany the pencil component, but that's normal for multi-pens of this price range. The only complaint I have about the gel refills is that I can never remember which color is assigned to which clicker! Most multi-pens either use a clear body (or window) or colored clickers to indicate refill color, but the EnerGel has neither. This can be frustrating because in many cases I don't know what color I've selected until I start writing. I'm sure this has something to do with cost, but I'd like to see some kind of indication of ink color — even if it's small! Apart from those minor issues, this is a great pen. It's not much larger in diameter than the regular EnerGel pens, so you should feel right at home if you're already accustomed to the weight and feel of the standard pen. 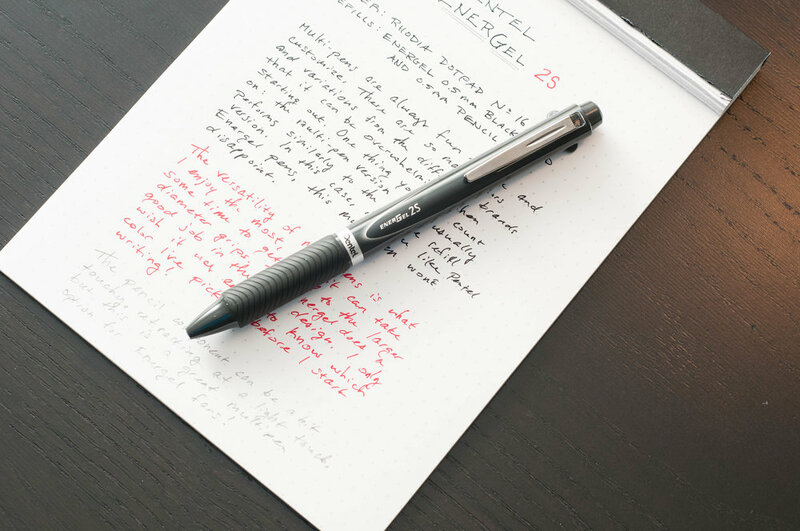 The EnerGel comes with 0.5mm black and red refills installed, and those appear to be the only colors and sizes offered by Pentel for this pen. But, not to worry! 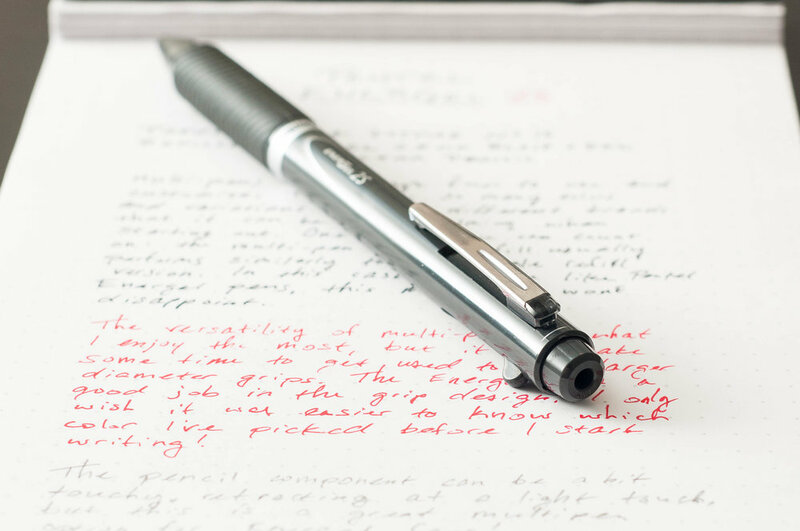 My all-time favorite multi-pen refill is compatible with this pen body: the Uni Style Fit. The Uni Style Fit refills come in a wide range of colors and sizes, so you can customize this pen as much as you want. Aside from that, you can choose from a white, dark blue, dark gray, or black pen body. If you're a fan of the EnerGel and want the convenience of two colors in one body, this is a no-brainer! And at just under $9, the price is just right. Enjoy reading The Pen Addict? Then consider becoming a member to receive additional weekly content, giveaways, and discounts in The Pen Addict shop. Plus, you support me and the site directly, for which I am very grateful. Membership starts at just $5/month, with a discounted annual option available. To find out more about membership click here and join us! Posted on November 8, 2017 by Jeff Abbott and filed under Pentel, Energel, Multi Pen, Pen Reviews.